When February rolls around and Valentine’s Day with it, I suddenly start craving more red in my house. Anyone else? I used to have red accents in my kitchen year-round and kind of miss them. It made things feel cheerfully cozy this time of year when the temps are chilly and there’s often snow outside my window. This charming 1912 beach-side cottage in Beach Haven, New Jersey, suits my mood today exactly. The homeowners broke away from the typical beachy blues and went with red instead. The Dutch door starts things off on a charming note from the start. Washable white denim slipcovers protect the chairs. I can attest to the fact that they work. We’ve had a white denim slipcover on our playroom sofa for 10 years and it washes up great. Very durable. 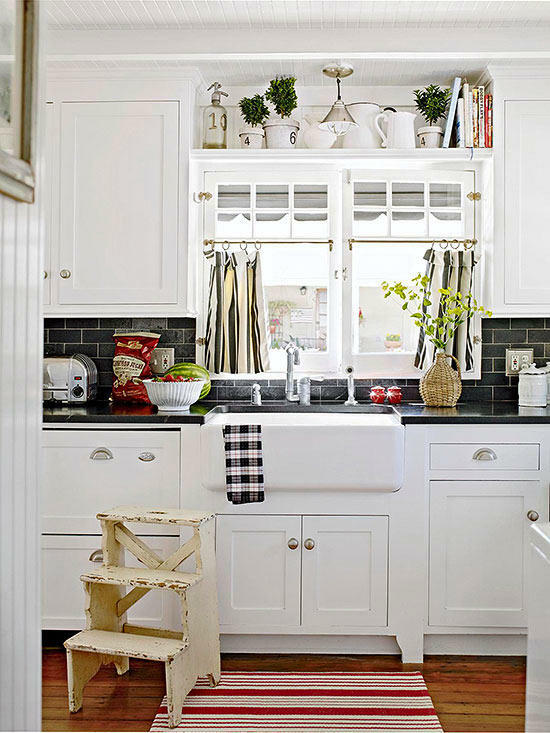 I’d never think to do that much black in a beach cottage kitchen, but it totally works here. Oh my goodness – I love it! What a lucky homeowner to have such a glorious beach retreat! That black backsplash sure was a gutsy choice, but I love that it gives a twist on straight up cottage. It totally works! My thoughts exactly. We have a beach cottage with the same white cabinets and black counters. We haven’t gotten around to putting up the tile backsplash, just assumed we’d do white subway tiles, but this black tile has given us an idea that would never have occurred to us before! Love it. Really nice! Makes me wonder what the house looks like from the outside? Click that link at the end of the post to go to BHG.com–there’s a photo of it there! Oh I love everything about this beach house! Beautiful! Casual perfection. Wonderfully done. The vintage accents & decor styling are the icing on the cake. I love the decor in the beach house. Of course, pretty much anything in red makes me swoon. The white-washed fireplace is brilliant! What great historic cottage – they did a fantastic job! Beachy. Cottage. Vintage. Perfect! I could hang my hat there permanently. Absolutely LOVE it! So often when I see rooms or entire homes decorated in black, white and red, it sometimes looks either too retro, modern or just simply dated. All I see when looking at this home is a charming, cozy beach cottage. It’s a beautiful home and I love everything about it! If I could pick this house up and move it to my property I totally would. I don’t know how it’s possible how a person like me can have so many favorite houses, but I do. How am I supposed to decide on a house plan when there are so many different architectural details that I love? We’re do you get the white slip covers? Do you have to get them made special for your furniture? Magazines always show them on furniture with the sisal rugs. Love the look but it must be expensive. I got mine at Target years ago (for the playroom sofa), so it isn’t as fitted as these. 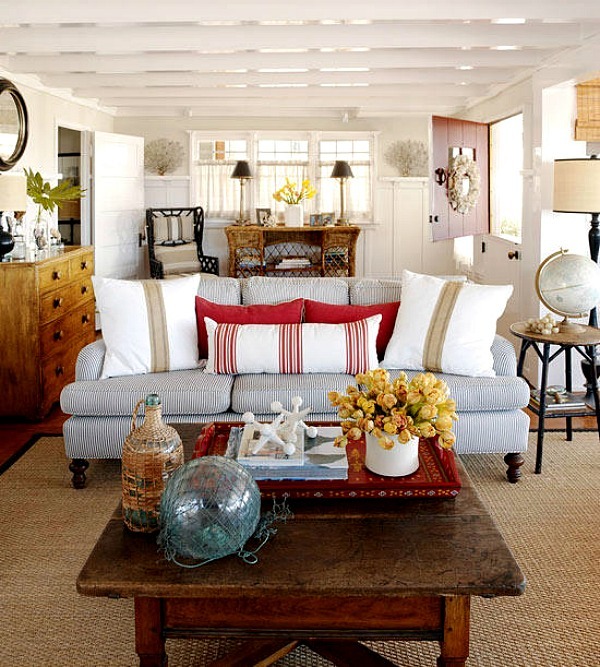 However, the slipcovered look is so popular now that a lot of furniture is sold this way. For instance, I have the Ektorp sofa and chairs with slipcovers from IKEA, so they’re made specifically for those pieces of furniture and are fitted for them. They weren’t expensive at all. You can get them custom made or from more expensive furniture stores, too, of course. Sometimes they can cost more than the chairs themselves! I love it! Maybe one of my favorite homes ever. I’m sure I’ll be pinning every picture. Like you, I like the unexpected color scheme. I love everything about this house. The red on the door, the furniture, the black backsplash, all the pillows. It’s beautiful. Beautifully done. Love all that you did. Red is my favorite color. Everything is very tastefully put together and very welcoming! Love it! Red can sometimes look dated in a home, but they way they used it in small doses, coupled with the white walls, is so perfect!! Oh-so-lovely in every single way! Love Love Love! I’m not a fan of red, but like how it is just used as accents and can be easily changed out. I LOVE all of the antiques mixed with plush, comfy furniture! That could be my forever home. I want these homeowners to adopt me. I love this house. Oh yes! It is my favorite color scheme, AND this is one of my favorite homes featured in a magazine. Such a cute and welcoming place! I could easily move in and not change one single thing. I love the pops of color from the accessories. They make the home look warm and inviting. Too funny! I have had the photo of this living room on my fridge since I saw it in the magazine. I’m obsessed with the sofa! Great to see it all again on your blog! Love everything about this cottage. And I’m not even a red person (I’m of the blue persuasion ;-)). What a pretty look! I love the color blue, but I am *not* into shells and fish and marine life. So the beach style I see portrayed in magazines seems to be “Cover every horizontal and vertical surface with shriveled bits from the ocean and beach.” Okay, maybe not that extreme… Anyway, this is a refreshing beach cottage style. Thank your for sharing! Absolutely beautiful. Love the colors and the general style of the home. My fave picture is of the white chair in front of the bedroom window with that view. I will look at these photos again for instant stress relief! Thank you. Oh you little beach cottages…how you and your bright reflective light bewitch me. Beach cottages are renowned for its oversized rooms and suites, which are ideal for families. What color neutral paint did you use on your walls? Follow the link to the original article and see if they mention it! I followed the link from your other post to this and I’m so glad that I did. I love this. I just adore it. I’m not usually a red person at all, but I really love how they used it here–it is simply perfection. I’m usually much more drawn to blues and greens, however here I love the red and think they completely understand the concept of what judicious use means. I really appreciate that they whitewashed the fireplace working with the red, instead of painting it completely white or making it more modern. A Dutch door would work well in this environment too given the sea breezes and that there usually isn’t a lot of issues with bugs. I love the vintage look and feel of the place and I really appreciate that they saw the potential of the place and respected the footprint. I grew up loving and appreciating homes like these and if this is Newport Beach I once knew it well. Glad to see other people who appreciate these homes as I do. I’m happy knowing that they still exist. Thank you for featuring such an inspiring and lovely gem. My gosh wouldn’t you just love to live here.